Filmmaker Elio Petri cut his teeth on Italian arthouse cinema, but with Investigation of a Citizen Above Suspicion (1970) he did the unthinkable by making a radical political film within the mainstream Italian film industry. It was an audacious move that won him international acclaim, but scorn from some critics in his native country. Investigation features a pretty ballsy premise for its time. A chief homicide inspector (Volonte) murders his lover (Bolkan) to test the limits of his authority. He’s an alienated psychotic trying to make sense of the world. She was having an affair with another man (Tramonti) who knows what the inspector did. In a novel twist, the inspector does his best to become the number one suspect in the murder he committed. To add a bit of kink, there are flashbacks depicting the inspector and his lover recreating crime scene photos of murdered women. Gian Maria Volonte is exceptionally chilling as a murderer with a badge. His inspector wears an impenetrable stone faced expression in public and the actor is able to convey the calculated cunning nature of his character with his eyes. The inspector’s chutzpah is something else. After calmly cleaning up after himself he calls the police and reports the murder, leaving before they arrive. He then arrives at the police station and berates a subordinate for not responding to the call fast enough before celebrating his promotion with champagne that he took from his dead lover’s fridge! As the film continues, you wonder just how much longer the inspector can maintain this ruse as he abuses his power in a flagrant way that anticipates Harvey Keitel’s corrupt lawman in Bad Lieutenant (1992). Petri meant Investigation to be a savage critique of the political upheaval that was rife in Italy at the time. In fact, during filming, a bomb went off in Milan killing 17 and wounding 88 people. His interest in making more politically explicit films began with Investigation and continued with The Working Class Goes to Heaven (1971), a labor conflict/melodrama/horror film, and Property Is No Longer a Theft (1973), a fable about a thief allergic to money. They make for an informal trilogy that wears its political critique on its sleeve. The Blu-Ray transfer preserves the filmic look of Investigation of a Citizen Above Suspicion with a transfer that is crisp and sharp. 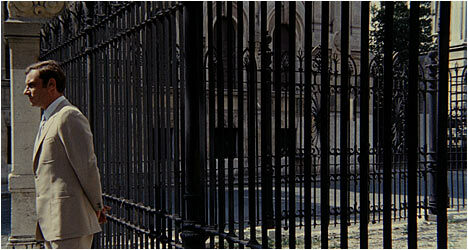 “Elio Petri” features an excerpt from an October 1970 French television program where the director talks about Investigation. He also espouses his philosophy of cinema. “On Investigation” features film scholar Camilla Zamboni talking about the film. She provides a brief biographical sketch of Petri and how he went from being a film critic to a filmmaker. She points out that Investigation was his breakthrough and became his most well-known film. Also included are over six minutes of trailers. “Elio Petri: Notes about a Filmmaker” is an 88-minute documentary made in 2005 that takes a look at the filmmaker’s career. It features friends and collaborators like Robert Altman, Bernardo Bertolucci and Ennio Morricone among others singing his praises. This is a fantastic primer to the man and his work. “Investigation of a Citizen Named Volonte” is a 2008 hour-long documentary that takes a look at the career of Gian Maria Volonte with interviews with the man himself. It paints an excellent portrait of a fascinating person who led a colorful life.